The Wort Hotel provides nearly 4,000 square feet of Jackson Hole event space. Handmade accents such as Western chandeliers and sconces, that feature cattle brands from local ranches, define these social spaces. The Wort Hotel offers complete in-house destination management services for all group clients. This complimentary service provides personalized preparation for all banquets, logistical planning and Jackson Hole group activities. State of the art Audio/Visual equipment including retractable ceiling screeens and recessed sound systems help insure flawless Jackson Hole meetings and events. 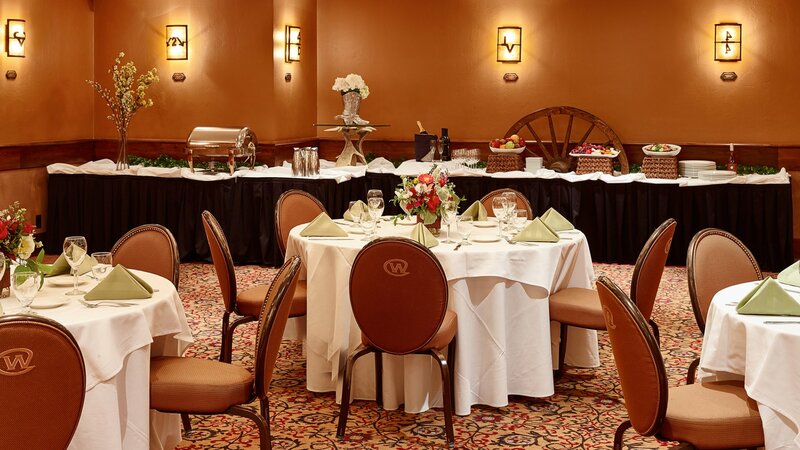 Our dedicated Banquet Chef and staff offer efficient food service with artistic presentation and mouth-watering selections from one of Jackson Wyoming's most established culinary teams. Download a copy of our Sales Kit to learn more about The Wort Hotel, our guest rooms, event spaces, and meetings capabilities. To learn more about planning your next event at The Wort Hotel, please complete the form below and a member of our meetings and events team will get in touch with you.